Today’s post is a sweet little kitchen gadget, perfect for the chef in your family – whether it’s mom, your mate, or your roomie. I’m a decently accomplished chef, as I think I’ve mentioned, but my Achilles heel is chopping onions. I blame it on the fact I have allergies, but I literally can’t chop more than half of an onion without extreme, blinding waterworks. If you know someone with a similar affliction consider snapping up a pair of Onion Goggles. 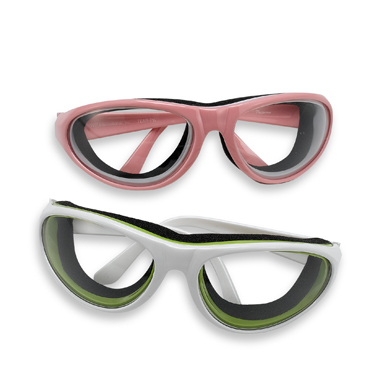 These swimmer-esque beauties are available in pretty pink and futuristic white, and seal around your eyes to keep out any of those pesky sulphenic acids. Nerdy, yes? Practical and amazing? Definitely. These aren’t a one-trick pony either. Consider throwing them on when chopping other eye-irritants like lemons, leeks, or chives, or grab them when frying with hot grease. 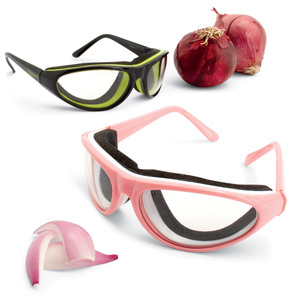 You can buy the Onion Goggles online at the Bed, Bath & Beyond website for a reasonable $26, which also includes a storage case.